despite its title, rubber is not actually about condoms. it’s that killer tire movie that came out earlier this year. there is already a movie about killer condoms, titled killer condom from 1996, a german comedy released by troma. un-dis-ir-regardless, a killer tire movie seems perfect for our site. if movies can be made about killer car, killer truck, killer cream, killer bulldozer, killer bed, killer laundry steam press, and killer wind (what!? noooo! ), a killer tire isn’t really that much of a stretch. turns out the trailers and marketing about rubber is only painting half the picture. it is mostly about a killer tire. but there is a whole other part, about a group of spectators watching the tire within the movie, much like we the audience watching rubber: the movie. this self-referential/post-modern/meta element gets about the same screen time as the killer tire. it ends up more like a killer tire movie with a dash of waiting for godot and a demented version of wall-e, with dashes of natural born killers, child’s play, and funny games mixed in. rubber opens with a monty python-esque absurdist bit with the town sheriff seemingly breaking the fourth wall, speaking directly to the camera about the “no reason” element in popular movies such as why e.t. is brown. it’s the filmmaker’s way of preventing audience from thinking of the why and the how of a killer tire story. although i don’t know how seriously we are supposed to take this monologue, especially when the sheriff got to oliver stone’s jfk and polanski’s pianist. the end of this monologue eventually reveals that the sheriff was not actually talking to us, the audience but the spectators in the movie. like i said, meta. our killer tire, credited as robert, wakes up in the desert. he first walks kind of wobbly, as one would waking up from a coma in the desert, then we see him develops first from crushing a plastic bottle in his way, then when he realizes he can’t crush bottles, he is able to telepathically make them explode. as we see in most serial killer movies, robert escalates in his killings, from glass bottle to crow to bunny and finally to human. pretty much anything that’s in his way or had done him wrong. like wall-e or chucky, robert also finds himself a love interest. in between robert’s story, we see the above mentioned spectators, with binoculars in the middle of the desert watching robert’s story unfold, frequently commenting on what they(we) just watched on screen. alternating between the killer tire scenes and the spectators self-aware elements, the first act works rather brilliantly. but as the ahem, wheel turns, it’s obvious that the robert story is the more entertaining one. after a while, the spectators scenes became preachy and boring. i found myself caring more about the killer tire plotline and dreads when the fourth wall breaks. the killer tire scenes are genuinely suspenseful and funny. writer/director quentin dupieux, aka mr. oizo managed to bring an inanimate object to life and makes robert sympathetic(without eyes or voice!) and you care about what happens to robert and the characters in that section. though sparsely entertaining, the spectators scenes are more or less symbols that you don’t really care about. the sheriff, played by stephen spinella, marvelously moves between the two sides. like most creative works, i’m pretty conflicted about rubber as a whole. while the robert story is obviously the more interesting of the two, i do admire the fact that the spectators stuff is in there, even though they don’t work as well. 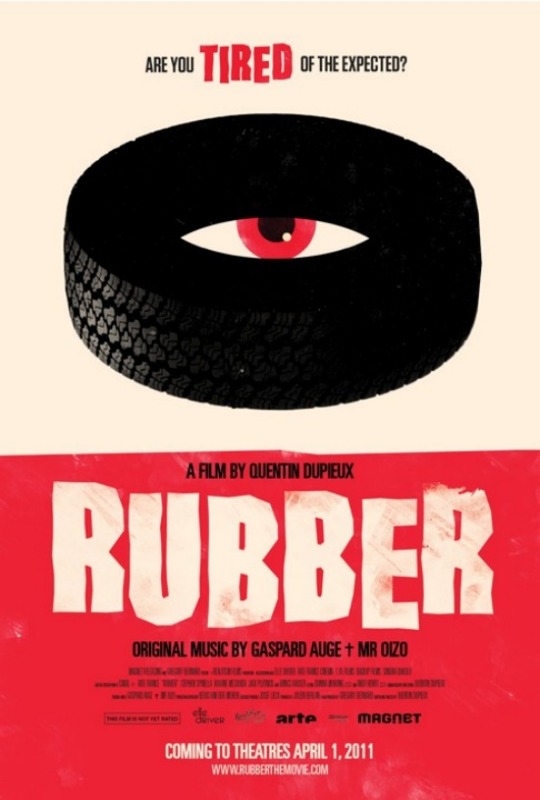 rubber works best as a black comedy about a psychotic killer tire, but the spectators/message elements want to make you feel guilty and stupid about enjoying the other part. at least that’s what i think the spectators stuff is all about. maybe the film is as conflicted as i am. with its light tone and jokey feels, it’s more like a friendly, gentle rip than pretentious, stern lectures like funny games or lars von trier sermons.